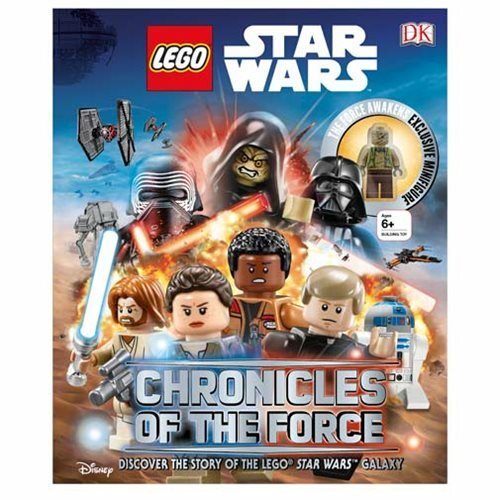 Uncover facts and tidbits about your favorite LEGO Star Wars characters and collect an exclusive LEGO mini-figure from Star Wars: The Force Awakens with LEGO Star Wars: Chronicles of the Force Hardcover Book. Featuring the latest LEGO Star Wars sets and mini-figures, LEGO Star Wars: Chronicles of the Force Hardcover Book is a fun and informative guide to a LEGO galaxy far, far away... A must-have for fans of the live-action Star Wars saga and its LEGO incarnation alike, with detailed information about the sets and mini-figures and illustrated with extensive photography. The 96 page book measures about 10 9/10-inches tall x 9-inches wide. Ages 6 and up.